Wedding Car Decoration Business is one of the best business with a small investment in Bangladesh. There is an image of a fancy car waiting for the most brides after the ceremony that they always adore and prefer. While chauffeuring them to their wedding reception in a luxurious fashion a wedding car decoration business helps turn their fantasy into a reality. So, you can be the right person to do the business if you’re really interested in cars and how to better enhance their look and performance. Also, it’s important to know about different models of various car brands, their parts, accessories etc before jumping on the business. But, the first thing that you must do that’s you should know what is currently trending in the market for car decoration. Also, if you feel it necessary, you need to take training to do certain critical jobs for car décor programs. When you’re in a wedding car decoration business in Bangladesh you need to search the products with their price details and other details in the market regarding the budget it’s up to you. Taking you from the marriage stage or town hall to the banquet hall or venue, the wedding car is the first impression you. So, take note of these ideas to make it stunning because it should be the most beautiful car. Also, when considering the wedding car decoration business for someone’s wedding there are many elements to consider. Mostly, it’s one of the first elements they’ll decorate if they’re going to have a wedding car. 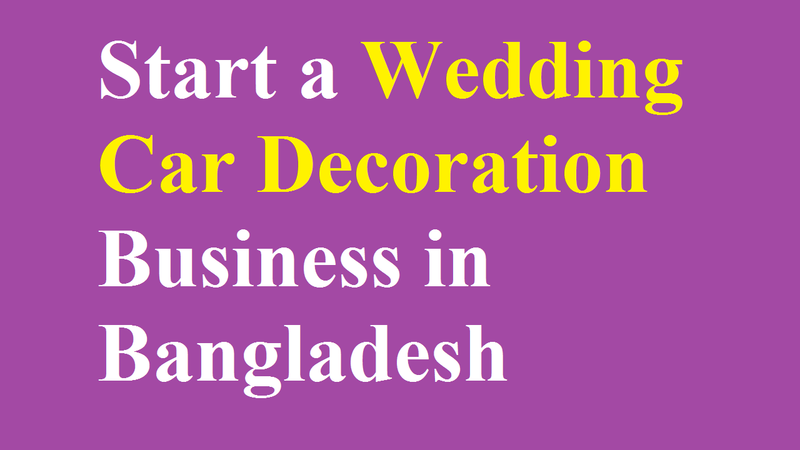 Well, let’s know the steps to start a wedding car decoration business in Bangladesh. It can be easy to start a wedding car decoration business in Bangladesh. However, it’s important to do your research and work hard to help you save money at the beginning like any other business. And, when the business gets off the ground you can start making money. As will surrounding yourself with help you can afford and customers who, time management will be critical to your success. Moreover, if you have experience working in the decorating industry before starting your own business it’ll be helpful. But, if you’re passionate about the business then the experience is not a blockage. You should volunteer to do some events for your family or friends if you don’t have good photos of past work. Also, do some free or reduced-fee gigs so that you can build your portfolio. So, make sure you have the right pictures that show off your work as it’s an important step to landing potential clients. Also, it’s helpful to promote your work when you have testimonials from previous clients. Besides, you must keep your portfolio in digital format and printed in hard copy so that you can show potential clients in person. It’s great if you have a location to host meetings with potential clients, which can be at a home office, a rented office, or an appropriate restaurant. What you have to do just ensure that the location is welcoming and it enables you to show your work effectively. That’s why to choose your meeting space carefully because many clients like to preview the decor that will be displayed at their wedding. This is one of the vital steps to get the efficient and affordable marketing tools. So, if you print fliers or coupons advertise online on wedding sites and social media sites, you can get your service out. Besides, in order to spread the word to their friends, family, and coworkers, encourages your previous clients. That’s why you must make a good relation with your clients and relatives that will be helpful for your business. When you like to obtain referrals for photographers, wedding planners, dress stores, and florists attract clients in word of mouth through obtaining. Also, providing a percentage of the sales for all clients endorsed by them offer to provide a finders fee. Moreover, either set up a kiosk showcasing your facilities or participate in wedding expos. Apart from the networking method, print silky brochures that outline expenses. Describe there most details of your services along with past works’ images. And leave these brochures at wedding stores, wedding planner’s offices and photographer studio with consent. Besides, get the service of a website designer in order to make a site for the business. This is because brides rely deeply on the net for some of their wedding car decoration business in Bangladesh. This is a great move to see how you will fit in the competitive landscape before you open a wedding car decoration in your town. You should consider whether your local market large enough to support another new business or not. You had better be sure that you are doing things much better than the competition if the answer if ‘not’.